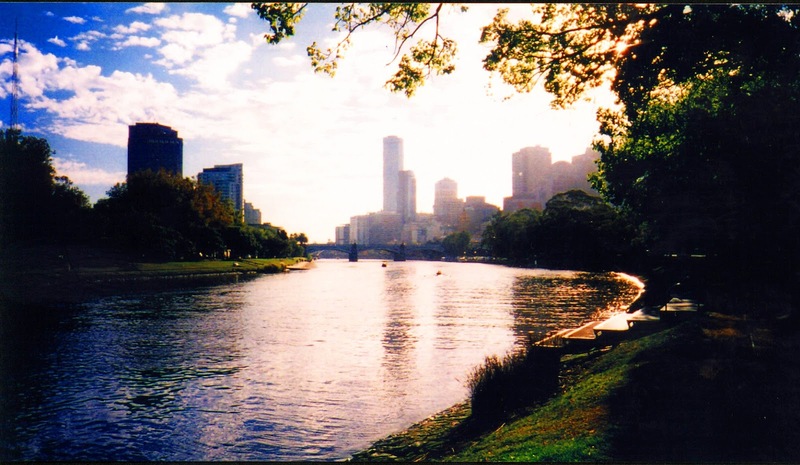 Melbourne - The Garden City - The Yarra River (Copyright 2000 - Kelly Martin - All Rights Reserved). I left Sydney with so many fond memories, It was scary arriving in a new city again. I had made myself at home on Crown Street. I guess it is part and parcel of being a traveller, never getting rooted for too long, otherwise you lose your sense of purpose, your sense of journeying. A university friend whom I briefly knew from back home, had moved into our Crown Street house near the end of my stay there. He seemed okay and was planning on moving on to Melbourne so we took the journey together. A long journey from Sydney to Melbourne, lots of stops along the way, sleeping with matchsticks in my eyes, I arrived in Melbourne a bit the worse for wear. (I realise I am not someone who can sleep on public transport - unless I have a horizontal bed, mainly because I have long legs and also because I get so excited that I want to keep my eyes open the whole time in case I miss something enroute). Arriving in Melbourne, we had booked into the main backpackers' hostel in the city for a couple of nights, into a twin room (bunk-beds). The hostel it was not a good hostel (I cannot remember the name of it but it was extremely large and in the centre of the city). Potentially okay if someone does not want to be social at all OR has arrived with a bunch of friends. For someone coming from a social experience of a share home it was rather like arriving into a school dormitory building where nobody spoke. The kitchen was huge, no intimacy at this backpacking hostel. I would say a passing-through hostel. Not my kind of hostel. I realise I prefer a more intimate touch. 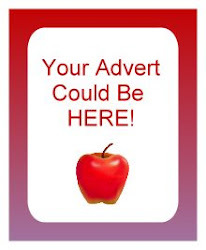 So if you are thinking of using hostels, consider what it is you are looking for and then make your choice. 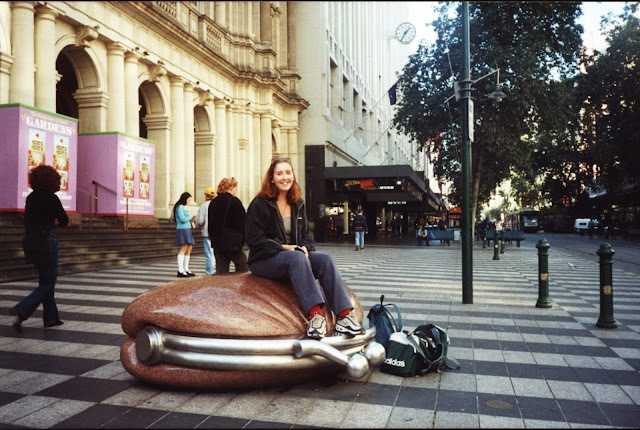 Melbourne has many fun and wonderful large sculptures dotted throughout the city, great for photo opportunities which simply makes the city a very cultural and artistic haven for travellers. My first week in Melbourne was a challenge to adjust, mainly because of the huge hostel and also because I was sharing the room with Tom. He stank of B.O and did the all-time-lowest thing you can do when you are sharing a bunk with a stranger, even more so with a woman. One evening, he came in after drinking, climbed onto his bunk above me, and began to spend a long period of the night masturbating. I got the full audio experience, I was so in shock I lay there quietly until finally I think I just shouted "for F%^$ sake". The next day I spent some time at the beach reflecting and he kept out of my way. Later that week I did not see him and I met up with Alison and Donna from my share house in Sydney as they had moved to Melbourne before me. And we had lunch in Little Italy. This was such a good feeling to be away from Tom and to actually feel connected with people again. The meal was fabulous and we talked and they encouraged me to move out of the hostel I was in to a new one. Finally I felt like things were changing for the better. Sometimes when your travelling alone you just need to touch base with some good people, embrace alone time, but really enjoy the social aspect. The hostel they recommended to me was the Central Melbourne Accommodation Hostel in the area of Richmond. A great, albeit small, hostel but it turned out to be so much fun and perfect for anyone wanting to work in Melbourne as it accepts long stay travellers. It also only allows a maximum of 30 people. Many are staying for work so you really get to know who you are sharing with. Great for forming friendships. (standing by the Yarra River, with the City in the background). Our hostel organised trips out, one of which was a 'Neighbours' night (the once popular soap opera based in Australia). Looking back it was probably a totally cheesy backpacking night but who cares if you have a whole heap of fun doing it. I was an avid Neighbours fan growing up and to go to a pub where Harold and some of the rather dishy co-stars were was great. I was star-struck (oh dear!). We danced and just had a good ole knees up as the oldies would say. So if you are young, new to backpacking get thoroughly involved, as you get more experienced your tastes will change and you may not want to do so many touristy things but go off the beaten track a bit more. However, in the beginning it's fun to get involved in the more traditional backpacking activities. 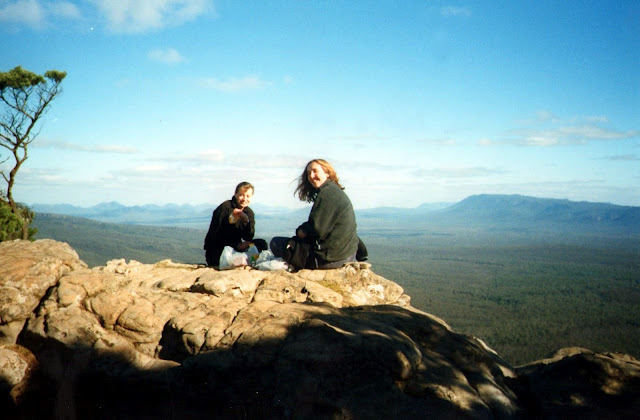 Pam & I in a beautiful spot for lunch in the Grampians National Park outside Melbourne, Victoria. A little way into my time at my new hostel, a couple of new friends and I hired a car and drove to the Grampians National Park for a night in a hotel. It was a very beautiful part of the world with awe-inspiring views. It was that weekend that cemented my feelings for my new friend Darren. My friend Pam had been flirting with him the whole time and being quite rude to me that weekend and I guess there is nothing like a bit of healthy competition to make you realise you have feelings for someone. Darren and I spent a lot of fun times together and did our own trip out one weekend to a place called Olinda in the Dandenongs rainforest region of Victoria. 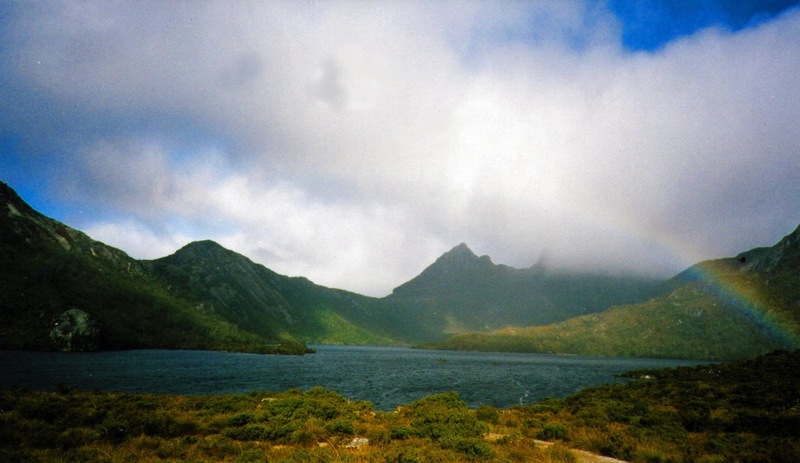 Outstandingly beautiful surroundings, a real treat if you are only on a short trip to the Melbourne area. 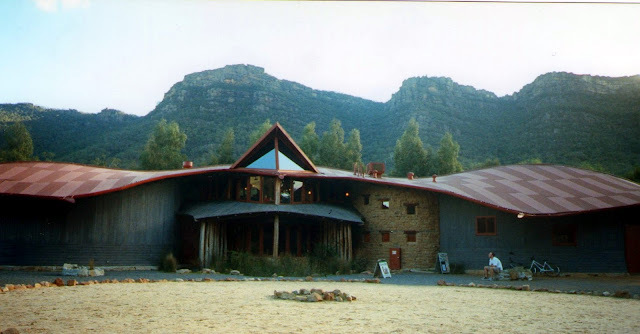 We had the pleasure of visiting a very creative, inspirational, aboriginal visitor centre, shaped like a Cockatoo (see photo below). And we stayed in the most fantastic accommodation called the A Country House; an old nun's retreat in Olinda. Our room was luxurious for the price and it made a lovely change from hostel life, waking up to breakfast on the terrace where we could watch Cockatoos waddling along the railing. I wish now I had taken photos but I highly recommend clicking the link above to get a taste of where we stayed and I highly recommend it. If you happen to stay in the Country House, a lovely place to eat is the Snooty Fox, we had delicately cooked rib-eye steak which fell apart in my mouth. It was juicy and highly addictive to my taste buds. Even though it was 13 years ago I can still remember the flavour! Other than visiting Olinda, we went to a very sacred place to visit when you are staying in Melbourne, William Ricketts Sanctuary. A spiritual haven and an immense artistic accomplishment. You need to see it, touch it and feel it to enjoy this wonderful place. 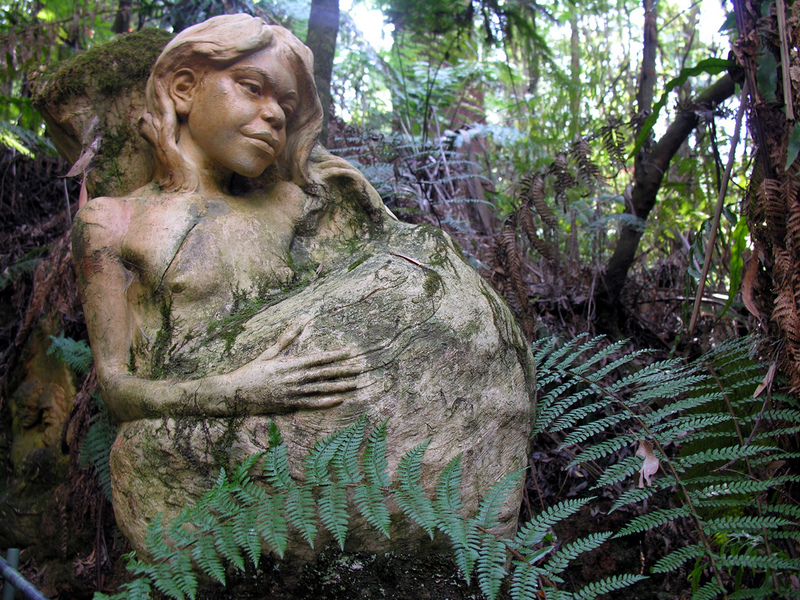 After a lovely afternoon in the spiritual centre of William Ricketts Sanctuary we somehow managed to find a cafe within the forest run by some British people. They made us the best tea, scone and clotted cream I have tasted in a very long time, the perfect end to a perfect day. It is amazing looking back on my trip now with fresh eyes and a more experienced heart and mind. I would take more photos, focus my attention on the finer details and record my journey far more clearly. I guess now it is very possible to do this, as back then I had no digital camera or mobile phone with wifi connection, no amazing applications like Instagram to photograph sumptuous food. However, I think I captured it quite well and my memory is not too bad for it being 13 years ago. My house-mates and I had a fun night out at the MCG in Melbourne. The Richmond Tigers were playing the Kangaroos. 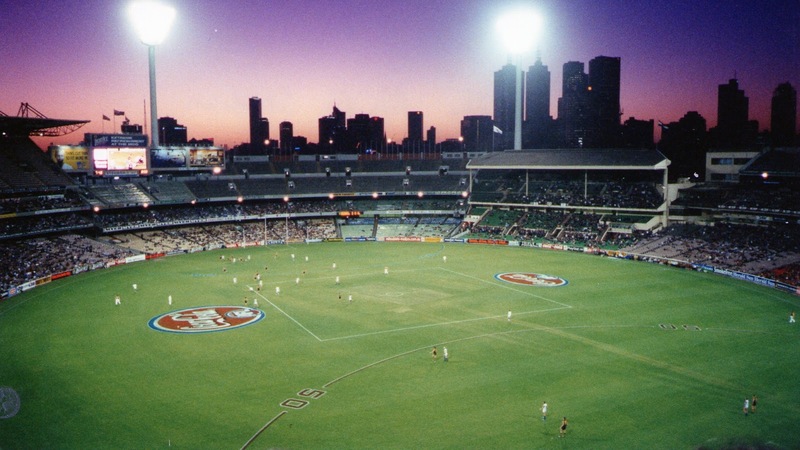 Fantastic stadium with an amazing view of the Melbourne skyline. 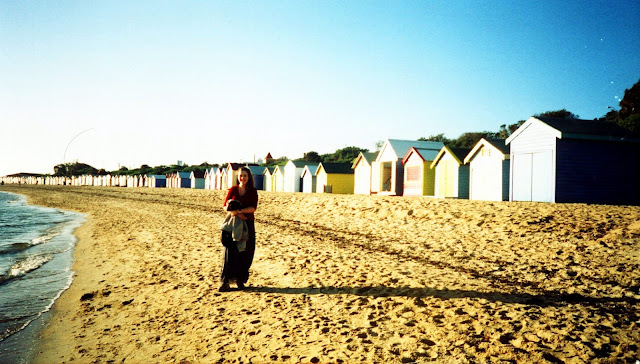 On another day out with Darren, we visited a place called Brighton Beach in Melbourne, beautiful photogenic beach huts laid out all along the sand. While in Melbourne I managed to get a lot of work, which was fantastic as I was down to my last $50 upon arrival. I worked in a large office and I was a paper-pusher basically, but the pay was good and I had a laugh as we sat around tables talking a lot of the time. I made some great friends and one in particular was a lady called Melinda Knight. Melinda opened me up to a new way of looking at the world. 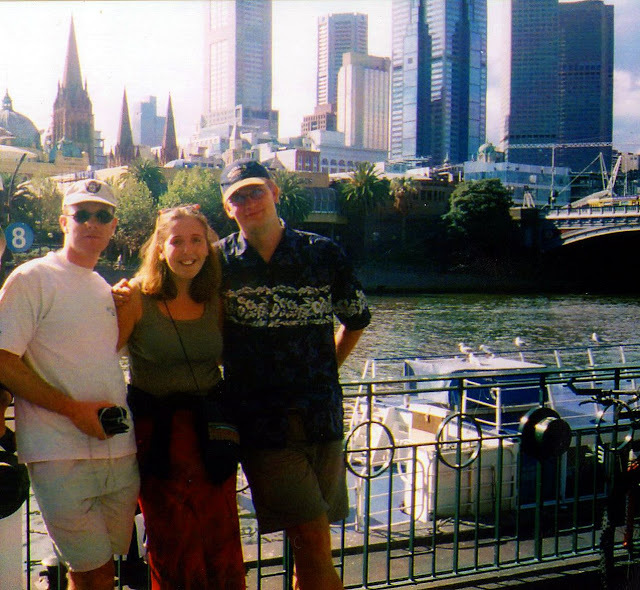 Before I met Melinda I was your typical backpacker, drinking, partying, but Melinda showed me something else. One day while we sat around doing paper-work a few of the ladies were talking about faith. One Irish woman was saying how her Catholic faith sustained her; the lady to my left talked about her spirituality and a form of hands-on healing called Reiki. I suddenly became very sad inside. I felt something was missing in my life, a connection to something deeper. Melinda, sensing my feelings, made one statement to me which has stuck in my mind to this day : "When the student is ready the teacher will appear". And she was right - she was my first teacher. After that day we met a few times and she gave me treatment on my knees. I had, on arriving in Melbourne, suffered a rather painful affliction in my knees. My knee-caps were dislodged and I had fluid on them. The doctor at the time freaked me out by telling me I would not walk again if I did not go home. I was devastated. I saw a physiotherapist who told me to ignore the Doctor and that he did not know what he was talking about. I had a few traditional treatments but nothing really eased the pain. So after talking with Melinda I agreed to see her as she was a holistic therapist specialising in Bowen therapy (also Reiki) and I went for my first treatment. Bowen therapy is an amazing therapy. Very subtle movements and was developed by a physiotherapist in Melbourne (now available worldwide). She did some movements on my body and left me for a few minutes; all this heat came out of my body; I was astonished the body could do that. Afterwards, we sat down and she had tears streaming down her face. She told me she did something called channelling and connected with angels. I was a bit unsure of things like that back then, but what she said as she cried touched me a lot and was very true. She told me that I would change so much I would not recognise myself. And she was right. After my initial meeting with Melinda I started looking at the world in a whole new way, seeing the bigger picture and realising that there was a lot more to heaven and earth than I had ever imagined. I went from drinking heavily to cutting back. And my days off on weekends I chose to go on days out while the rest of the hostel was hungover from the night before. One journey I took was with a couple of friends - on the Puffing Billy steam train. This was a fun, childlike day out. I enjoyed hanging my legs out of the train as we moved through the forest and on the way back I sat next to none other than Dr Karl Kennedy and his family from Neighbours (I am aware writing this that anyone of a younger generation may not think this is very exciting - but it was for me at the time - grin!). 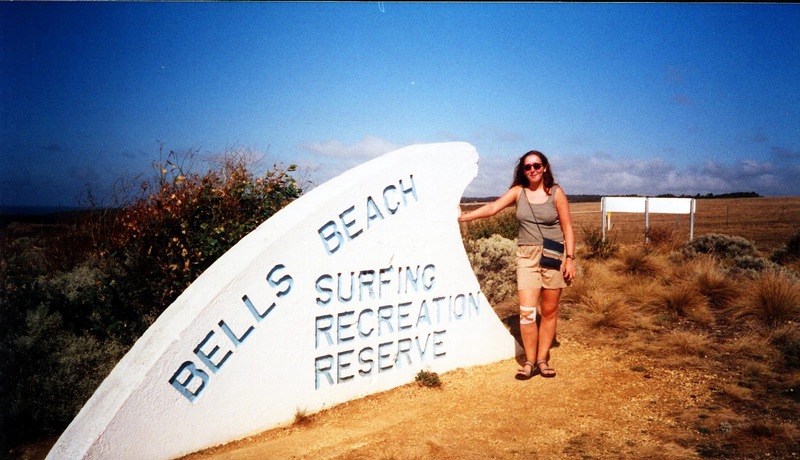 Bells Beach - The movie Point Break was filmed here. 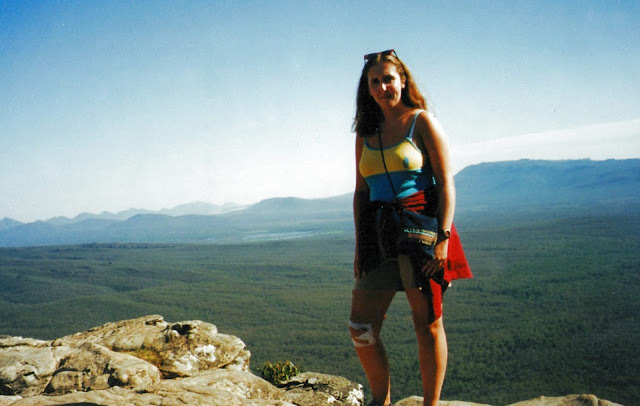 Here I am bandaged knee, my knee was probably a bit of a crutch back then to get out of things I did not want to do. But I learned over time just to embrace the new. Before I left for Australia I met a lovely lady called Beth in a local outdoor clothing shop I was working in, in Newcastle Upon Tyne. She was visiting from Australia and she wanted a new pair of hiking boots. I had a lovely long chat with her about boots and socks and we ended up exchanging details. She was so kind to invite me to come stay with her in Australia. She lived in Point Lonsdale and I took her up on the abundant offer. After a few months of living in Melbourne I took a long weekend staying with Beth. It was such a grateful experience for me to go from sharing a bunk bed in a crowded dorm room to having my own room with a double bed, wonderful fresh fish for dinner and lots of visits to places I may not have gotten to on my own. Beth took me on a tour of the Twelve Apostles and we drove down the Great Ocean Road and stayed the night. We stayed in a lovely cabin in Port Campbell called the Port Campbell Cabin and Camping Park . We later went to a gorgeous seafood restaurant where I had prawns, calamari, salmon and salad. If you ever travel, try lots of food - it's a big part of travelling sampling many different cuisines throughout the world. A short walk to a viewpoint on my trip with Beth. Travelling is truly life-changing. 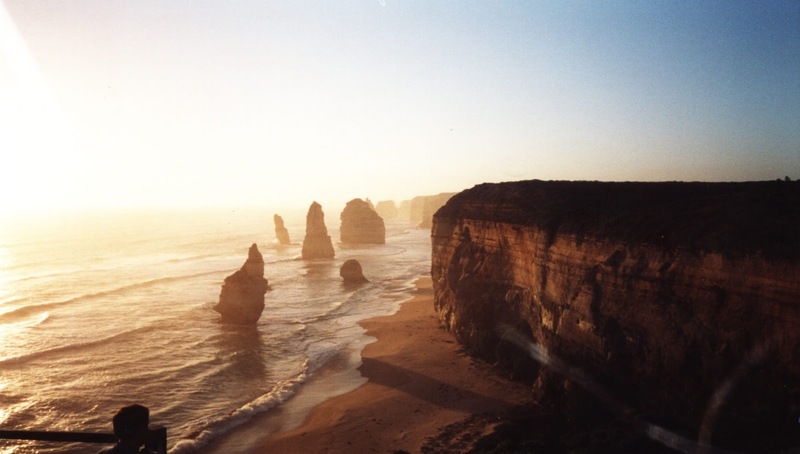 The 12 Apostles - a thing of beauty. Sun-set being the perfect time to view them. I am not sure how many apostles are left now as time may have worn some down. I feel blessed to have seen them all. Beth gave me another gift upon leaving. She gave me the address and contact details of her son in Tasmania. Being given places to stay for free, to live with locals is one of the real pleasures of travelling. Staying in hotels and hostels is wonderful, but staying at home with a real Australian family really makes it all worthwhile. Her son and family let me stay for a few days and I had the opportunity to breathe the cleanest and clearest air I have ever breathed so far in my life. 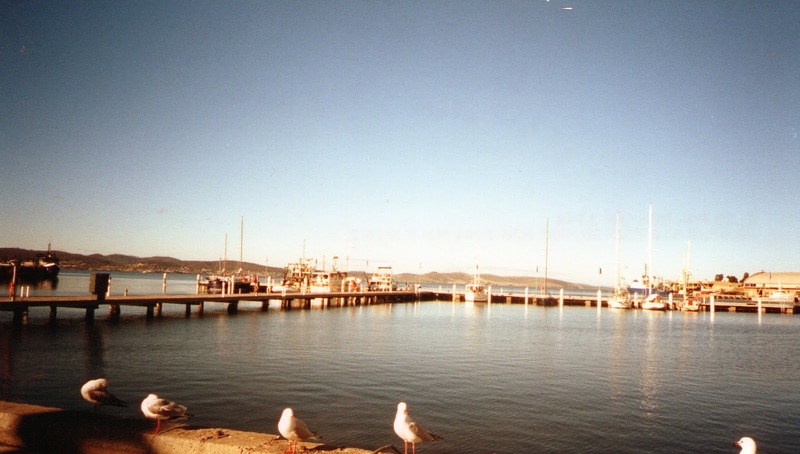 Hobart the capital of Tasmania is a very clean, clear and cosmopolitan laid-back city. I enjoyed going down to the water, sitting on a bench eating fish and chips looking at the crystal clear blue water and breathing in the pure air. 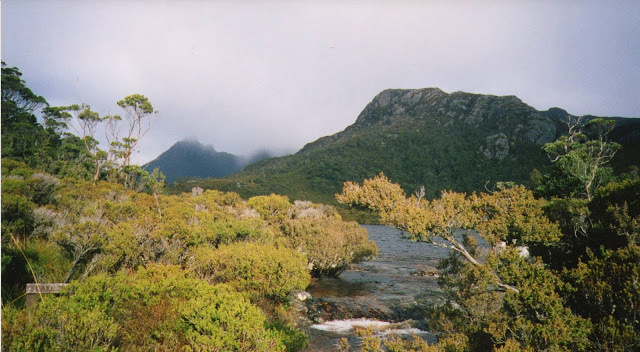 While in Tasmania I walked through national parks, experienced (un-touched by human hands) immense beauty and connected with my true nature. Travelling made me realise how much I love the great outdoors. 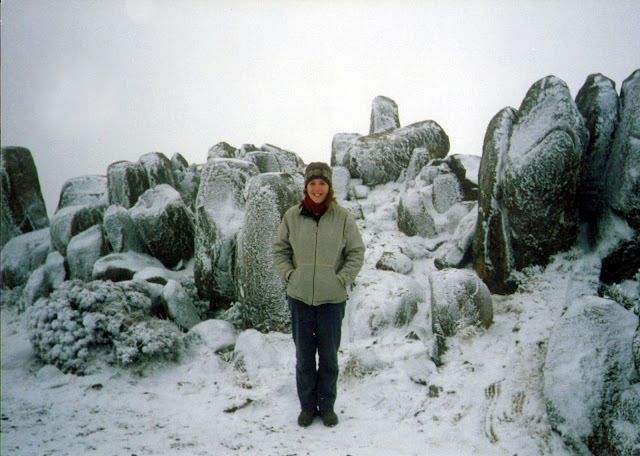 On the top of Mount Wellington - Tasmania, sometimes you do need warm clothing. 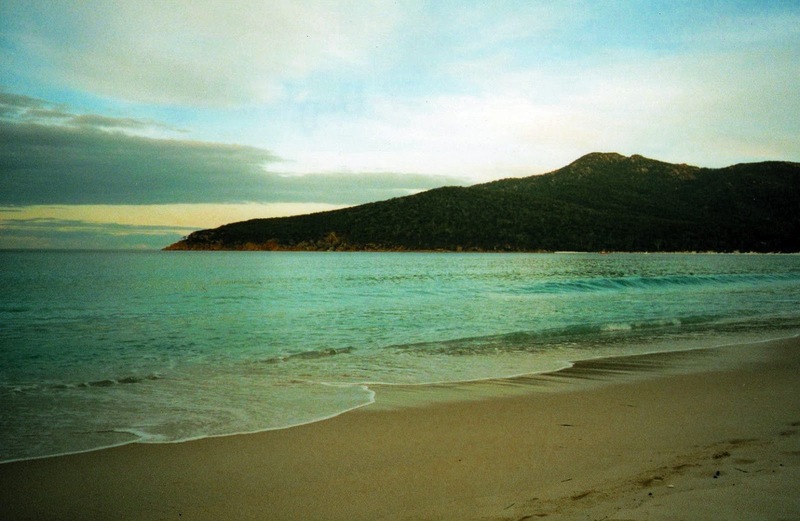 Just after sun-set at Wine Glass Bay - Freycinyt National Park. Once my office job ended, I got another job working as a personal assistant. I had done a bit of office work in the past, but never as a personal assistant. To be quite frank I was useless at it. I hated answering phones all day, but the person in charge at the time was also new to his role, and the office was new, and I think I was there just to fill in and get some basic duties done while the real P.A started. It was an okay job; the people there were lovely; I was paid well again, and this gave me the income I needed to enjoy more of Australia. 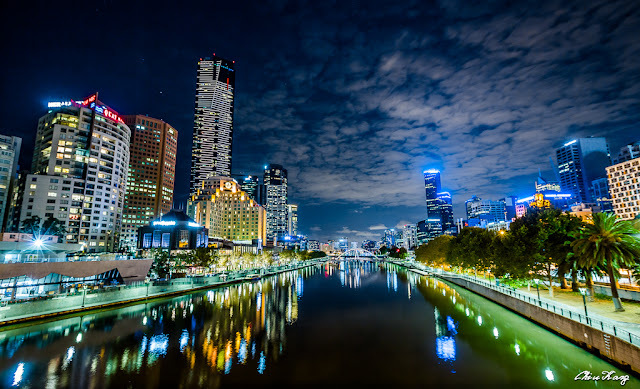 I worked in one of the tall business office blocks on the Yarra river in the city and enjoyed wandering along the numerous eateries and bars by the river each lunch-time. Melbourne has a wonderful waterfront, restaurants, entertainment, art and sculptures. It is a wonderful place at night too with huge dancing fountains lit up with light. One of my favourite 'naughty' lunches I had while working there was a basket made from a taco shell base filled with crispy thick wedges, topped with a cheesy creamy sauce and bacon pieces. I drool just thinking about this right now. I love eating and love all kinds of sensuous experiences, so travelling is indeed food for my soul. After a while of staying in the hostel, a work colleague from my earlier job asked if I would like to move in and stay on her sofa-bed and pay rent there. I leapt at the chance to live like a local and to not have to share a room with 5 others and a hostel kitchen. We had a nice time up to a point and I think she found her home a little cramped when she met her new boyfriend and wanted more space. It was understandable, but I did not like how her cat decided to evict me from the place. He took it upon himself to urinate over all my belongings and backpack. And well, being a tom cat you can imagine the smell. Aah, oh to the joys of travelling. Melbourne, like Sydney, holds a very special place in my heart. Apart from meeting some amazing people I began a new journey, a personal quest to find myself, a spiritual journey now and my travels changed because of this.